La Villa came alive over the weekend with people gathering to have fun at the Pinocchio festival. Carlo Collodi, Pinocchio’s creator took his name from Collodi, the birthplace of his mother. 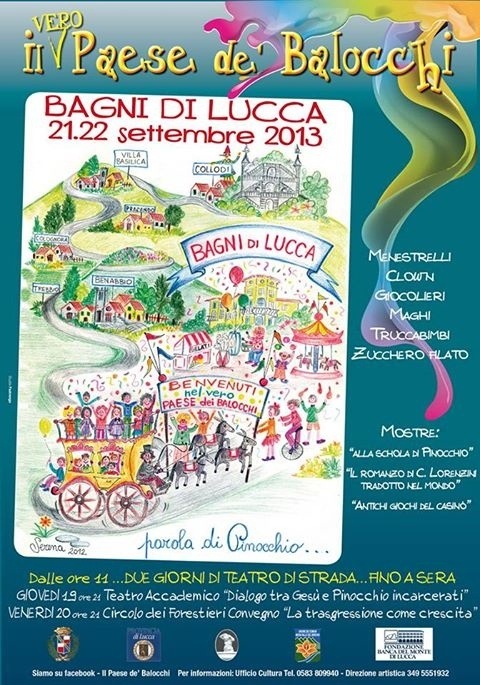 The village is not far from Bagni di Lucca and the character is very popular in the area. Morena sent me some photos of the celebrations. Morena and Mariangela did a great job with the children, helping them with their beautiful paintings. I was lucky to be in the village last year for the celebrations. Click here to see the fun. Thank you Morena for sharing the weekend with us. This entry was posted in Things to see and do and tagged Bagni di Lucca, Italy, local events, Paese dei Balocchi, photogrpahy, Pinocchio, travel by Debra Kolkka. Bookmark the permalink. I will have to visit the Pinocchio Park in Collodi one day soon. Thank you for sharing the fun with us. Oh how fun! Italy has so many festivals – it’s wonderful to see them through your blogs, Deb, thank you! I love the local festivals. I wish I could be there for all of them. It made me feel like a child once again, Debbie thank you. It must have been fun fun…by the way I love the blue whale…and yes, the princess as well….. It looks like great fun. I hope there are some wonderful things happening when I get back next week. What fun! Love the people in costume. I think it is great the way people dress up and join in. I remember last year’s post. That looks like so much fun. I love the children’s paintings. I think we have some excellent young artists in Bagni di Lucca. I love the way the children are so involved with the festivals. Thank you so much for posting this – we got married in Bagni on this day, and its lovely to have a reminder of the fun in the village on our wedding day. You might be pleased to know Massimo didn’t have his donkey’s ears on when he married us later in the day! I’m pleased to hear the mayor was not wearing his donkey ears when he perfromed the ceremony.